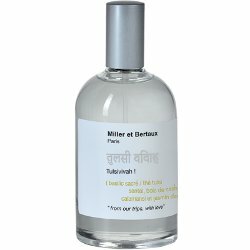 Niche line Miller et Bertaux has launched Tulsivivah!, a new unisex woody citrus fragrance. We can summarize Tulsiivah! [sic] the scent, like an exploration of tulsi or holy basil, a festive vision of India. Like the other perfumes of Miller and Bertaux, is an unisex eau de parfum. The notes feature basil, bergamot, cashmere wood, coriander, bitter orange, sandalwood, orange wood, hedione, jasmine, cedar and musk. Miller et Bertaux Tulsivivah is available at Nose in France, in 100 ml Eau de Parfum. I’ve tried In from Miller et Bertaux and it is unique and beautiful. I’d definitely like to give this a try. I am still a fan of Green, green….but my bottle turned, and probably won’t buy another. Wish they did travel sizes. It is a funny name. They misspelled the name of their perfume in their marketing blurb? Well, no, that quote is from Nose. That is reassuring. I like (but not love) several Miller et Bertaux. I would give this a try if I happen upon it. I need to go back to France and learn how to dance, because this also seems like it would be perfect. There is the more available Basil/Neroli from Jo Malone?